A farm operation is a complex system. You have to be aware of what your weakest link is at any particular time and adjust your management accordingly. You also have to be opportunistic without being exploitative. 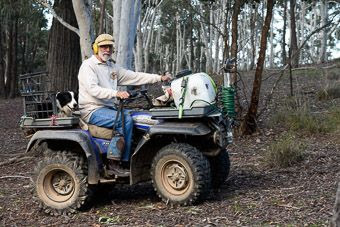 I’m a partner in the family farm here at ‘Talaheni’, which is in the Yass Valley area of New South Wales on the Southern Tablelands. 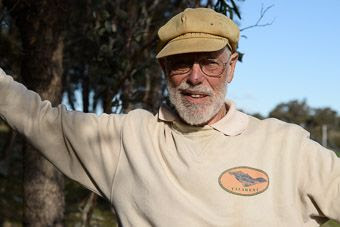 I was raised on a sheep property in western Victoria. 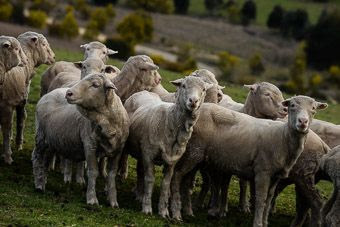 Our farm is focused on producing ultrafine wool and wethers for Sharlea shedded operators, along with some cattle and a small farm forestry operation. 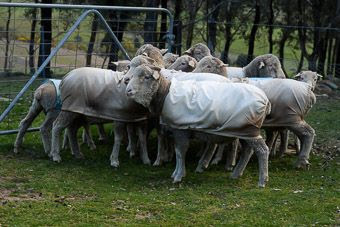 While this area is renowned for the production of superfine wool, our ultrafine flock is at the finest end of the spectrum, with an average fibre diameter of 14 micron for adult sheep. When we bought this farm over 30 years ago, we knowingly acquired a bit of a challenge. I didn’t want a place where everything was done. 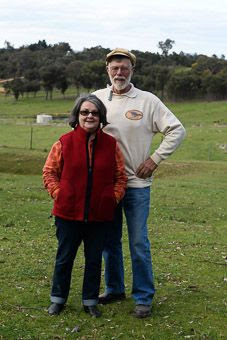 The farm was part of a sheep property that had held the record price for wool back from the 1950s. 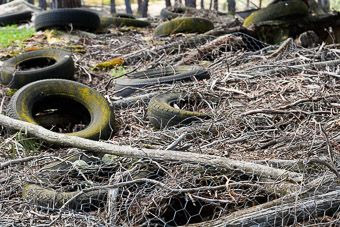 It was regarded as a basket case – it was just so rundown, neglected, totally gullied and barren, and oozing salt all through the landscape. It was pushing to carry one dry sheep to the acre. The first thing we did, because there was a series of gullies, was to put in about 3.5 km of contour banks to slow the water down. The next issue was the soil acidity. The pH was 3.6 so we spread Canberra sewage ash and in 2 months that lifted it from 3.6 to about 5.8. Next we located the high water infiltration spots – the highest was 3000 mm per hour, when our rainfall is only about 720 mm per year – and we planted trees on those spots. We took the sheep off some paddocks and we got this tremendous regrowth of trees. We’ve got over 200,000 trees by doing nothing more than opening and closing gates at the right time, plus hand-planting about 25,000 trees. 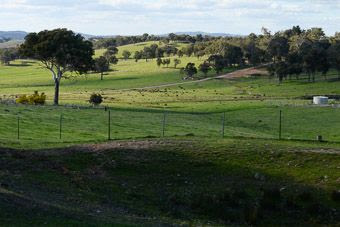 Originally the farm was 9 paddocks, done like a checkerboard with no relation to the soil variation, landscape, the different pastures, or the different native grass species. And when it’s just one big paddock, sheep will go where the ‘ice cream’ is every day rather than using the whole paddock. We’ve re-fenced the place in accordance with soil and landscape characteristics including, particularly, the sloping aspect. We’ve gone from 9 paddocks up to about 54 and we’re still proceeding to fence more. Each paddock can accommodate about the same number of grazing days per year. In the best country, the paddocks are very small. As you get up into the slopes towards the ridges, they get bigger. 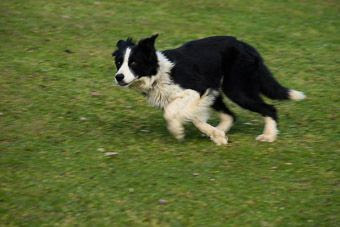 In the course of a year, they carry about the same number of stock on a rotational grazing basis. By doing that alone, we’ve got about 6 weeks extra grazing on green feed for stock. That has been vitally important, because it means we’ve got green feed when we come to wean our lambs around about Boxing Day. For the first 20 years of running our farm, we were averaging 750 mm of rainfall a year, but there’s been a dramatic decline in the last decade. We’ve got 38 years of rainfall records. When we hit the 35-year mark, I did a trend analysis and it was quite a surprise. We’d lost 100 mm of rainfall in the critical autumn period – March, April, May – but then ‘regained’ almost the entire 100 mm in late spring – early summer, from late November, December, to January. For the type of pastures and the conditions we have here, that’s far less effective rainfall. We’ve got an agriculturally inferior climate to what we had 35 years ago. Those trends seem to be continuing. Our rainfall overall has trended down over the past 30 years by about 5 mm per year. It doesn’t sound much, but over 30 years that’s 150 mm (or 6 inches). That can be the difference between having a good spring and a very, very average spring. This area can have either winter-dominant rain or summer-dominant rain. It’s unusual to get both in the one year. The last time it happened was in 1989. But in the period 2000–09 we missed out on both good summer and winter rain. Since then, rainfall has improved but autumn rainfall still remains scant, except for 2014. And the nature of the rainfall is different. 35 years ago or so, when it rained, it could rain for 3 or 4 days at a time. Now, instead of that gentle sort of rain, what we get is a sharp rainfall event. They tend to be further apart and quite heavy falls. For instance, in January 2009 we hadn’t had rain for a couple of months, then we had 37 mm in about 37 minutes, with no follow-up. It’s difficult to manage for that sort of rainfall event and make good use of it, because you get a lot of run-off when ground cover is minimal after a poor previous spring. The sheep numbers go up and down. January is when I go through classing sheep and cull any that underperform, for whatever reason, whether it’s because they haven’t made lambs or the fleece doesn’t measure up to my expectations. Then I look to see what the seasonal forecasts are, particularly for autumn and going into winter, and then it depends on how big the market is. The major decisions for us centre on deciding on our stock numbers in February–March, depending on the current and predicted conditions. That is the critical time when we sit down and work out how many stock we’ll look to join in April, how many stock we’re going to carry through to August shearing and how many stock we’ll offload. That coincides with our most vulnerable period. If we don’t get rain in autumn, and that’s becoming more the norm, then we’re in for a pretty bleak season. After the drought period ended in 2009, it took us 2 years to breed the replacements to get back to our usual stock numbers of about 800. Since we’ve done the improvements, our carrying capacity is increasing at 0.15 DSEs per hectare per year, which might not sound much, but multiply that by 30 years, and that’s a hell of an improvement. We would be running the highest stocking rate than anyone I know in this immediate vicinity by quite a bit. I put that down largely to the way it’s been managed and getting the small paddocks and using controlled grazing. Maximising soil moisture and then using it efficiently is one of the most critical things in our operation. We have shallow, rocky, poor quality soils. They hold only about 60 mm of soil moisture, compared to most cropping country which holds 150–240 mm. We retain as much as possible where it falls, and minimise the amount of run-off. Then, we make sure the pastures are set up to make maximum use of the available soil moisture. Our grazing plans take all of this into account. We have noticed a tremendous difference in air/soil moisture positions over time. This is largely because of the way we’ve built the place up, particularly the soil carbon. This area used to be 0.7% soil carbon. We got it up to 4.2% and that has led to greater infiltration and greater holding. We’re using the moisture where it lands, but that can also have a downside: dams which we used to rely upon for stock water now just don’t get the water into them, so we’re putting in a network of reticulated water system. Although we now graze only two-thirds of our place, I think the areas are interrelated; the non-grazed, revegetated third provides huge benefits to the other two-thirds. And we now carry more stock, producing a better product than when we grazed the entire area. For instance, one paddock had a hill in the middle, so we fenced it, based on slope and aspect, into about 8 paddocks, like spokes of a wheel. The north-west face is where we get most growth in winter, but is the first to hay off in late spring. By being able to hold stock on areas as pastures start maturing, and progressively controlling the movement of stock around the hill, we are able to get an extra 6 weeks of grazing on green pasture in a good year. We need a mix of pasture systems so that we have pastures that will respond to the summer rain and others that will respond to the winter rains. It’s unusual to have the same pasture species growing at all times throughout the year, though Microlaena, a native perennial grass, is pretty good at producing any time throughout the year. We’re looking at getting some alternative pasture species and varieties that will be more tolerant of the changing seasonal rainfall pattern and the drier, slightly shorter growing seasons projected for the future. Under unusually wet conditions and with warm temperatures, we find that our pastures grow and get away from the stock too quickly. So we move the sheep almost daily to take the top off the pasture so it doesn’t get too high and rank. Usually, they might have been in paddocks for a week to 10 days. Winters are notorious for their cold conditions. It’s not unusual to get frosts down to –7°C for up to 10 days in a row. Last year , we had about 20 frosts for the year. This year  we had more than 20 in May alone. Then there are the strong cold winds we tend to get in August–September. You don’t want miserable weather during shearing or lambing, and we’ve now got a set-up where we can manage August shearing and September lambing with minimal losses. Long ago, with miserable weather after shearing, we lost 80 hoggets, so we built shelters out of bush logs, old wire netting and old carpet at a cost of about $20 each. The biggest one holds the whole flock and I’ve got four of them and a couple of little ones. There can be 25 °C difference between inside and outside, taking into account the wind chill factor, and that can be the difference between life and death for a freshly shorn sheep. Now, the sheep gravitate to the shelters when conditions turn bad. In October 2011, we had very bad conditions, with rain and sleet for the best part of 24 hours and then snow, all mixed with strong winds. We’d heard about the front coming a few days earlier, and my daughter and I moved all of our lambing ewes and lambs to smaller, more protected paddocks. In the middle of it, I checked the lambs in one paddock who looked as though they were dead or about to die, even though the ewes were still with them. I carried some big rocks to the lambs, putting the rocks on the side the foul weather was coming from. I was surprised: within half an hour or so the lambs were up and away with their mothers. There were reports of losses of thousands of ewes and lambs in that event throughout the area. We lost only one lamb. But the biggest challenges are those things over which I don’t have control. One is markets, and the second is climate. I’ve got data from the Bureau of Meteorology, downscaled to our farm, on what the climate change expectations are likely under a 2-degree and 4-degree temperature rise, and I’ve run that through my own water balance model to see what the soil moisture position is likely to be to 100 years out. I found that we are going to go from being at or below permanent wilting point about 52% of the time up to about 62% of the time. The driest period we have ever had in 130-odd years has been 57% of the time, so we’re into new territory. In 2006, we were up around the 57% mark, and that was just dreadful. Every morning, I go onto the web and look at my weather sites. If the things I’m planning to do in the day are crucial, I look at them all, and adjust accordingly around those forecasts. If I have got critical operations coming up – spraying weeds, for example – and I see that the forecast is for late morning rain, I will get out early and race around within that narrow window of time available. I use as many forecasts as I can comfortably get across. I regularly use the Bureau of Meteorology, for instance for what autumn will be like. I use COLA’s precipitation outlook for Australia [aka WXMAPS] for planning what I will do in the next 10–14 days. I use the Norwegian YR site for hour-by-hour rainfall predictions. That site is not perfect but I am absolutely stunned how accurate it is. I’ve always kept an eye on climate and weather parameters. The main thing is measuring rainfall, which we’ve done here on ‘Talaheni’ for over 30 years. I also measure temperatures, and not just in one place. I have a series of thermometers across our place and we’ve worked out the variable frost hazard across our paddocks. That’s helped change how we manage our pastures. To check salinity, we have measured the depth of the water table weekly since about 1990. I’ve been told that’s the longest sequence of weekly groundwater monitoring in Australia. We measure the salinity levels of the groundwater and the dams. We’ve seen a marked improvement in the quality of the water and a lowering of the water table; that’s good for the pastures and livestock, particularly lactating ewes. I believe if you don’t measure or monitor something, you can’t manage it. Alternatively, there’s no point in measuring things if it’s not going to have a role in your management – that’s just wasted time and wasted effort. We used to regularly plant trees, then we ran into the drought and found that we had to water them every week and still lost a lot of them. So I decided we weren’t going to plant trees every year, but instead be opportunistic and plant only when we had soil moisture and the seasonal prospects were good. We did that in spring 2005, during a break in the drought, and had an exceptionally good survival rate of the seedlings without watering them. We skipped the following dry years and planted again in the spring of 2010 and 2011, with similar results – very high survival rates, high growth rates, without any follow-up watering. With the return of dry conditions, we deferred planting until 2014 when an exceptional late summer/autumn break provided excellent conditions for an autumn planting. Having had a couple of failures with planting pastures and trees, I developed a computerised daily soil/water balance model. I don’t use it every day, but when there are critical things coming up, I look at it all the time to see what moisture we’ve got down there, and then combine that with the forecast to predict the future. All our pastures and every tree we planted were established using that model. We’ve found a niche market, which is producing ultrafine wool and Sharlea wethers, and we do it in a very ‘clean and green’ way. In 2011, we were fortunate to be awarded the National Carbon Cocky Award plus several other categories for our better-than-carbon-neutral farming operation. From that coverage, a major wool processing company in China wanted to buy our entire wool clip, with a substantial premium, on the grounds of our environmental credentials. I have found that people visiting Talaheni – and we host many hundred visitors every year – have been very interested in hearing about the MCV Climate Champion program, even overseas visitors. What I’ve got out of it is the opportunity to meet fellow farmers. It’s inspiring. It’s rubbed off in how I’ve gone about doing things here, always on the lookout for what someone else is doing, and how that might go for our operation.